In a three part story, KHOU-TV reports on a four-month investigation into radioactive contaminants in the Houston area drinking water. Revelations that came to light shows hundreds of water providers around the Gulf Coast region are providing their customers with drinking water that contains radioactive contaminants that raise health risks, according to state lab results and public health scientists. The data, from thousands of state laboratory tests from water providers across Texas, provided by the Texas Commission on Environmental Quality (TCEQ), ranged from 2004 to the present. Watch part one of this investigative report. The radiation was first discovered as a part of required testing, under federal regulations, of all drinking water provided by community water systems in America. Click here to check radiation levels in your water system. Part one of the report shows that in Texas, the Department of State Health Services provides an independent lab to test the water for potential contaminants of all kinds and forward results to both the water system and TCEQ. Much to the surprise of many people, hundreds of water companies along the Gulf Coast and all across Texas pump water with some amount of radiation inside. One particular type of radiation that popped up again and again in water provided by utilities all across Texas, was something called alpha radiation, which public health scientists say can be particularly problematic and any amount of alpha particles, even when consumed in amounts below federal legal limits, raises your risk to develop health problems or, in rare cases, cancer. Examples of alpha particles found in the Gulf Coast region are those from uranium, radium and other minerals. The EPA made the disclosure in the federal register as part of the National Primary Drinking Water Regulations 2000 final rule that regulates all forms of radioactive elements in drinking water. The “zero-threshold” allowance for radionuclides, from a health-based standard, is one reason why the EPA set the drinking water federal health goal, called the MCLG (Maximum Contaminant Limit Goal), at zero for all forms of ionizing radiation. Other potential contaminants in drinking water such as copper, selenium, barium, chlorine residuals, trihalomethanes, and many others that are not radioactive elements, all have goals set above zero. The EPA states that they believe its position is based on weight of evidence and support from national and international groups of experts interested in radiation protection. While nearly every major city in Texas has no detectable amounts of radiation in their purified water, according to United States Geological Survey officials, the Houston region and surrounding counties are prone to having natural uranium deposits that are near the aquifers that provide well water. Lab reports reveal radiation in Harris County Municipal Utility District #105’s (MUD #105) water dates as far back as the early 1980s. MUD #105, a suburban water provider outside the city limits of Houston, did not receive a formal “legal” violation notice until it exceeded federal limits in 2008 and 2009. State tests show the well has always tested above the federal health goal for radioactive alpha and has consistently come close to exceeding the “legal” limit for alpha, and in more recent years, tested in similar levels for radioactive radium, too. One of those local water systems, known as the Suburban Mobile Home Park 2, violated federal legal limits for alpha radiation in 2003, 2004 and 2005. Yet, the Texas Commission on Environmental Quality allowed the drinking water to continue to flow to residents there for years after that, despite consistently testing with some of the highest readings for alpha-particle activity and uranium in Texas. The TCEQ placed the Suburban Mobile Home Park on a Compliance Agreement which began on July 23, 2007 and ended on July 23, 2010. The TCEQ is awaiting monitoring results to evaluate the system’s compliance performance status to determine further action. KHOU also obtained a database of every enforcement action TCEQ has taken over the last six years and noted no actions had been taken against Harris County MUD #105. However, seven days after TCEQ released its database of enforcement actions to KHOU, the agency then entered into a compliance agreement with MUD 105, but has not fined the utility. Part two of the investigative report reveals even more disturbing information about the state agency charged with regulating water quality for Texans. For more than 20 years, the Texas Commission on Environmental Quality under-reported the amount of radiation found in drinking water provided by communities all across Texas. As a result, health risks to people consuming the water have been underestimated in many water systems where radioactive contaminants are present. The TCEQ regulates water systems for compliance with federal safe-water drinking regulations. 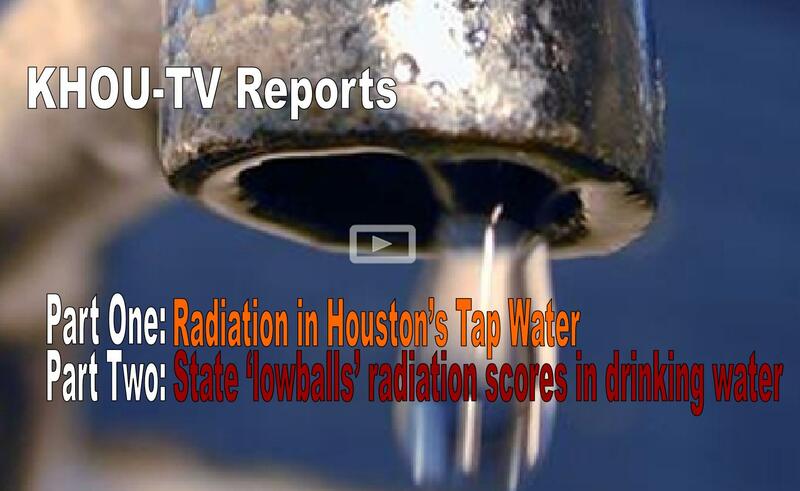 However, KHOU has learned the state regulating agency consistently took radiation readings it received from the water testing lab run by the Department of State Health Services and lowered the “official” radiation readings reported by the independent lab. The TCEQ would do this by subtracting off the margin of error for all radiation readings it would receive. The subtractions helped some utilities avoid radiation violations that could have forced them to clean up their water decades ago. Watch part two of this investigative report.